File format conversion has always been a complicated issue. Take MS Outlook for example. Windows Outlook data is usually stored in PST file format, which is not supported by other email clients. If users want to access Outlook PST file data using other email applications, they need to convert the file. On the other hand, MBOX is the file format supported by various email clients on both Windows and Mac platform. Therefore, by converting PST File into MBOX format the Outlook data can be made accessible by other emails. However, the conversion process will vary depending on the availability of the operating system. Considering this specific requirement of the users, this below article will discuss the methods to convert Outlook PST into MBOX format on Windows and Mac operating system. Read on to know about the most sought-after solutions of this file conversion process. Scenario: Mandy came across some orphan PST files in her system. Being a Mac user, she uses Apple Mail and she knows that apple mail is not supporting PST file format. She wants to know if there is any easy method to convert PST into MBOX file for Mac machine because Apple Mail accepts MBOX files. So that she can use her PST mails in the Mac machine easily. Solution: Mac/ Apple Mail accepts MBOX files for importing mails, so if you want to import the orphan PST file into Mac machine, you need to perform Outlook PST to MBOX format conversion. By using the Mac Outlook email client you can easily migrate file into MBOX file. Follow the steps to perform the conversion and import MBOX file into the Apple Mail. Launch Mac Outlook 2016 or 2011 version on Mac system. Click on File and then Import. Select “Outlook Data File (.pst or .olm)” option and then click right-arrow. Choose Outlook for Windows Data File (.pst) >> click on right-arrow icon. Go to the location of PST file and select it. Click on Import and the PST file data will be moved into Mac Outlook. Open the home screen of Mac Outlook and under On My Computer section, the imported file can be found. Drag this folder to Mac desktop and the file will get saved in MBOX file format. This file can be imported into Apple Mail using its native import option. Remember: In this process, only one PST file can be imported at a time. Moreover, users need to install Outlook for Mac email application on Mac machine if it is not there already. Scenario: Alex uses MS Outlook on his Windows system at home. He needs to send his Outlook data to one of his colleagues, who is a Mac machine user and he has only Apple Mail installed on his machine. So, the requirement of Alex is to convert Outlook to MBOX format, which is compatible with Apple Mail. And also Alex does not have the access to Mac machine so he is looking for a method that can be performed on Windows system to migrate Outlook PST into MBOX file. Solution: In order to turn PST file into MBOX format on a Windows machine, there is no direct method available. 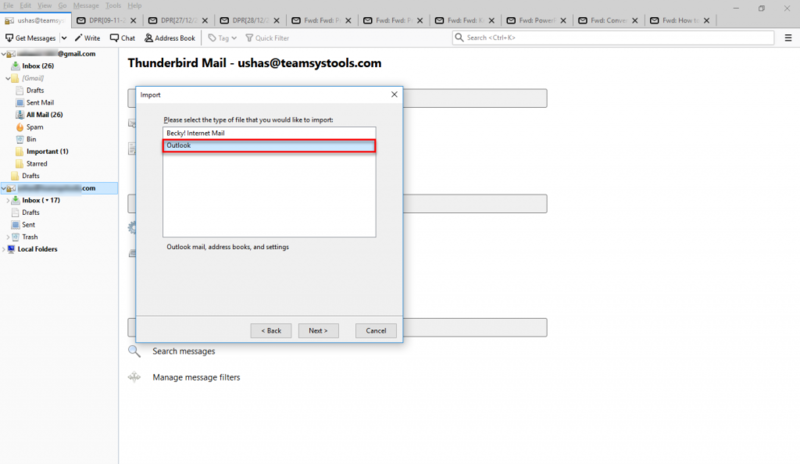 For that process, users need to take the help of another desktop-based email client named Mozilla Thunderbird. Here is the step-by-step guide to performing the conversion of PST to MBOX with Thunderbird. Before starting this process, make sure you have both MS Outlook and Thunderbird installed on the same Windows system. At first, type Default App Settings in the Search box of your Window system and click on the search result. The list of Default Applications will appear. 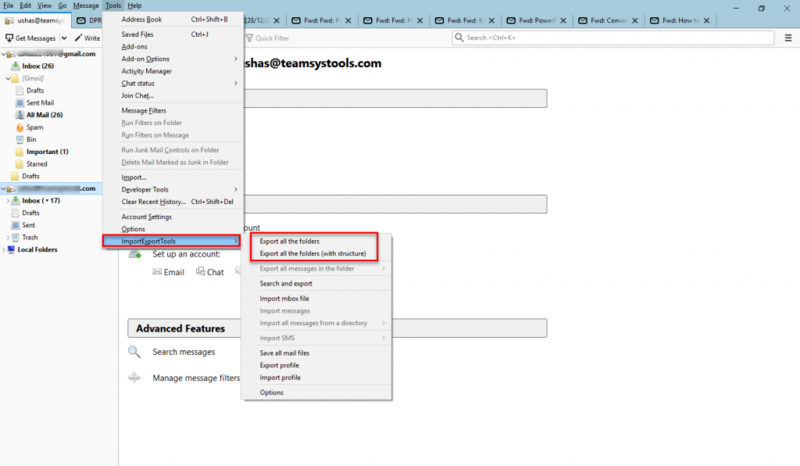 Check if Outlook is the default application for email. If not, click on the email that is default and from the list, choose Outlook. Thus, MS Outlook will become your default email app. 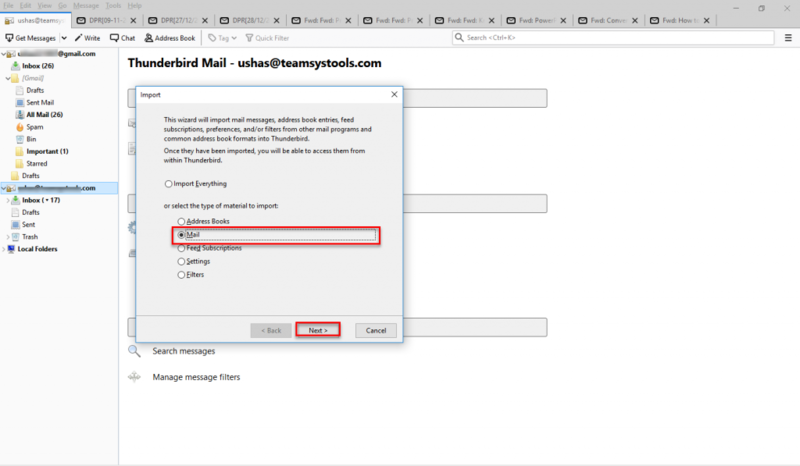 Open Mozilla Thunderbird and click on Tools option from the Menu bar. A list will appear from which, choose Import. Select the radio button beside ‘Mail’ from the dialog box that will appear next and click on Next. Select the Outlook radio button and click on Next>> Finish. When all your required data have been imported into Thunderbird, open Default Apps Setting again. Make Thunderbird as the default email for the system. 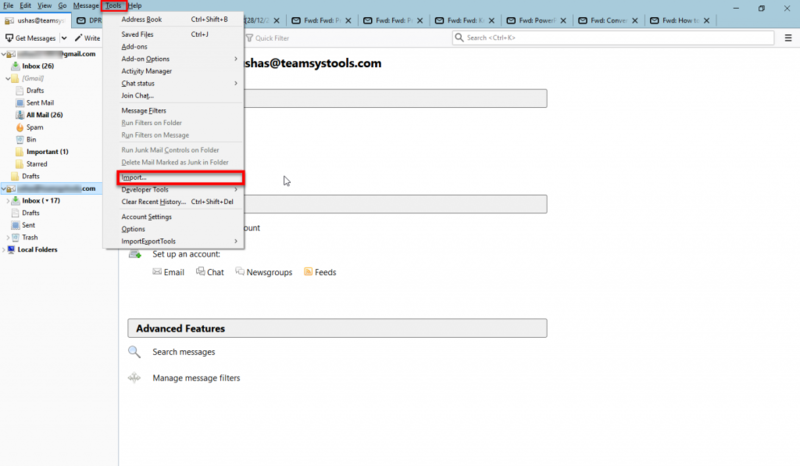 Open Thunderbird again and you will be able to locate folders containing Outlook data. Click on Tools>> ImportExport Tools >> Export folder (.zip) and choose a location for the file. Extract the ZIP file and you will get MBOX files. Transfer the files to a Mac machine and use these by importing into any compatible email client. Remember: This method is a long one and surely takes a considerable amount of time to convert PST to MBOX with Thunderbird. Moreover, it requires the installation of Thunderbird in the Windows system. Since both these techniques involve other email applications, many users find these methods troublesome and complicated for converting Outlook to MBOX. For them and others who prefer straightforward approaches, the ideal solution is Outlook PST to MBOX Converter. The best part of this software is that its different versions are available for both Windows and Mac. Here are some of the noteworthy features of this application. The conversion of PST into MBOX file is necessary to access PST data without MS Outlook. In this article, we have compiled all the best methods to convert PST to MBOX format both in Mac and Windows systems. Users can choose any of the approaches mentioned above for the best experience & according to their purpose of conversion. For smooth and fast migration of Outlook PST file into MBOX format, experts recommend PST to MBOX Converter. This tool offers a simple and straightforward solution to conduct PST file conversion on both Windows and Mac system.